Tsumiko inherits an ancestral home, a vast fortune, and a butler who isn’t exactly human. Humanity is rocked by the Emergence of a people who call themselves the Amaranthine. They are our myths and legends come to life. Neither human nor animal, yet embracing qualities of both, the inhuman races inspire both awe and fear. Every newsfeed is clogged with updates about the peace process, but some places don’t concern themselves with worldly affairs. Like the girls’ school run by St. Midori’s of the Heavenly Lights, where Tsumiko Hajime grew up. Release Date: February 22, 2018 – Now Available! She wasn’t aware of her gift’s significance, yet he expects to be courted. Kimiko enrolls at the In-between’s prestigious new high school, which is designed to promote the integration of the human and inhuman races. As a reaver, she’s supposed to act as peacemaker, bridging a formidable cultural gap, but the other two members of her triad don’t need any help in that department. Akira and Suuzu have been friends since middle school. Instead, the boys must rally behind Kimiko when she inadvertently initiates a courtship with Eloquence Starmark. Release Date: October 22, 2018 – Now Available! In doing her part for world peace, she puts one crosser’s whole world at risk. Conspiracy theories, werewolf scares, and protest rallies have hampered the peace process in America, where social and political unrest keep most Amaranthine from declaring themselves. Those not in seclusion rely heavily on illusion to mask their true nature. A wolf without a pack and a boy in need of roots become founders. After a heavenly visitation, one young wolf turns his back on his pack and on the moon in order to tread a lonesome path. A blaze of stars. A brand of copper. A burden of trust. First of Dogs, he takes a new name, makes peace with group of weary humans, and helps to found the In-between. This is a tale of the Kindred. This is the lore of the Starmark clan. Release Date: December 4, 2018 – Now Available! One sister, a pure light that beckons, the other, a fierce light that burns. Fira and her sister are chased out of another village. 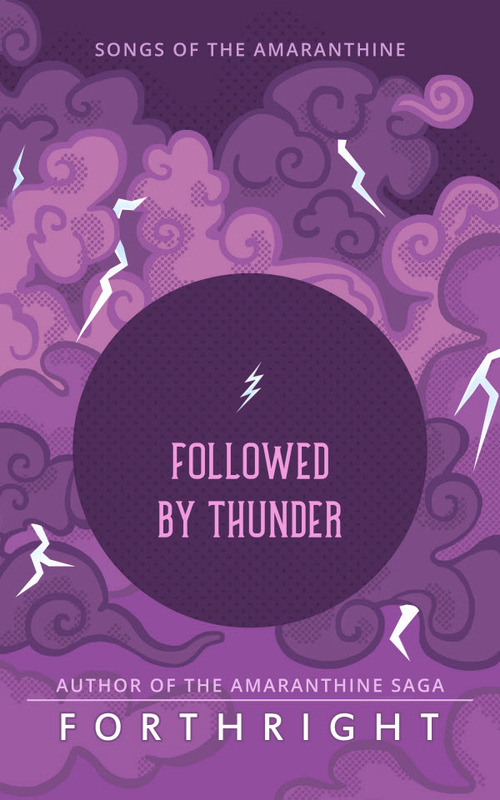 Fleeing on foot across the empty moors, they’re caught by a storm that roars like the monsters ever in pursuit. But the wind changes and the thundering brings a stampede of defenders who carry them off to a secret place. Where mares dance and rabbits mine. Where the lost clans hid a lasting treasure. Where the girls’ curse is considered a blessing. FAQ: Will the Songs of the Amaranthine ever be available in print? The Songs of the Amaranthine are short stories. At first, they will release digitally, but once I’ve collected four stories, I’ll gather them up and release them together in a print anthology. I’m going to go ahead and use the comments here as an informal FAQ. If you have questions, ask away! Do the books stand alone? Yes and no. Each book in the saga encompasses a story with its own beginning, middle, and end. All of them are romances, so readers can expect the same sort of storytelling found in my fandom adventures. But all of my serial writing turned me into a series writer. A larger story develops along the way. So I’d recommend reading the books in order. When can we expect these to be released? Wow! I’m psyched. Where will these books be available? would you know if this book will be available in bookstores in the Philippines? love your work so much! If they do not stock the book, they should be able to send for the book. It’ll be in their system. soph were you able to get Tsumiko and the Enslaved Fox here in the Philippines? I want to get a copy too. Are digital books (eBooks) no longer available? May I inquire as to when they might be again? The ebooks should be available everywhere and in all the usual places. I’m sorry but I can’t find it. Do you mind sharing a link? I live very far and I’d rather have the digital copy. Here’s the link to the US Amazon storefront – https://www.amazon.com/Kimiko-Accidental-Proposal-Amaranthine-Saga-ebook/dp/B07H4ZHLLL/ Perhaps it will automatically redirect for your area? KIMIKO AND THE ACCIDENTAL PROPOSAL should be available in *all* online bookstores, so pick your venue (Kobo, Book Depository, B&N, etc). Wherever you shop, I’d suggest searching for the full title or for the author name. “we are unable to complete your purchase. That’s rather unfortunate. I was looking forward to reading your books. My publisher/printer distributes worldwide. Where do you normally go to download ebooks? Check their catalog. Do we know yet what the price will be per book (digital and print)? Prices will post soon (though they’ll vary by country). Is the series based on your fanfiction Impeccable? The first book does indeed borrow from Impeccable in ways you’ll recognize. But the series is slated to have seven books … each with its own romantic adventure. So it’s bigger (and I hope better) than those beginnings. Is it true that the books are linked to your fanfiction? Yes. For readers familiar with my stories, the ties will be obvious. I’ve borrowed from several of my favorites, taking pieces of their plots or settings and adapting them to fit into the Amaranthine universe. But I don’t simply retell those stories. They’ve become something new. Which fanfics will you use? I’m keeping that a secret because it’ll make upcoming reveals more fun. Will Sesshoumaru and Kagome be there? In adapting my fics, one of the biggest revisions I had to make was to the main characters. No one wants to read seven versions of SxK … oh, wait. That’s exactly why we read fanfiction! However, in building the Amaranthine universe, I needed a new cast. Some of you will probably still try to back-hack my writing. “I found Miroku!” or “She might as well have named him Inuyasha.” But if I do my job right, the stories will take on a life of their own. Why did you label Book 1 “the first miko”? Are all of the main characters in your series shrine priestesses? No. While this certainly hints at the legacy of Japanese culture that helped inspire my fandom storylines, miko refers to the main characters’ first names. Book One is about Tsumiko. In Book Two, I’ll introduce Kimiko. Book Three’s story belongs to a lady named Tamiko… and so on. Just finished it last night (stayed up till 1 am I might add) 😉 I see Book 2 is called the Accidental Proposal… Is that one related at all to Troved? Please please please say yes because I adore that oneshot and have always wished (and left a begging review as well) for you to expand on it. Omg omg. I simply CAN’T! ❤ You said somewhere that Book 2 might be out later this year? I'm dying! I’ll announce a release date once the manuscript has entered the final phases of publication. Ideally, that’ll be yet this year. I squeeed (and maybe cried a little) when I saw the next title at the back of the book. Troved is one of my absolute favorite one shots. I eagerly await holding that volume in my hands. As for this one, I loved it from start to finish, a finely crafted tail indeed. Is there an audiobook version coming out? Not right away. Maybe later. Cheers from a German fan!! The series will be available in two formats: paperbacks and e-books. I’ll buy as soon as possible! You’re writing has always impressed me and been tactfully written! I love your narration and characterizations!! Seriously can’t wait til Feb. 22!! Goos luck with the release and one question I guess: Will it be written in any particular way like 100 words or entire long chapters? I suspect the latter but I do enjoy either! Thank you so much Forthright!! No, this story won’t unfold in 100-word snippets. The books in the Amaranthine Saga are nice, long, “proper” novels of substance. Well, hey! Since we in fandom know a thing or two about word count, I can give you a solid statistic. Tsumiko and the Enslaved Fox came in at 96,000~ words! While listening, I noticed that Hisoka is called a “Confirmed Bachelor”. Do you mean this as the slang in the 1950s for homosexual? I’ve always seen him as such, even before noticing and it brings my heart much joy. I also can not thank you enough for this series. I’ve read it several times and am just now getting to listen. Thank you for being you. Thank you for being a creative soul and sharing apart of yourself. You are a Beacon, and we were starved. Hello, forthright! I love your work and I just pre-ordered your book! Can we preorder through you the same way we order? Aww, that’s wonderful to hear! Thank you! Oh my gosh it’s released on Kobo already 😍 I’m so excited to read it! Thanks for being such a great author and bringing your fans so much joy time and again. Hi. Just an update—I got a notice today from amazon that my pre-ordered copy of the book has been delayed. I’m not sure why and I’m not sure if this is unique or more universal, but if it is more universal, I thought you should know. Anyway, I’m super excited to read this, so I may switch to a digital copy so I can get it that much sooner! You must be stoked, if not flabbergasted. I went to buy Tsumiko on Amazon, only to find it’s sold out! Not only that, but in the ‘New and Used’ section, they’re listed from $22 to as high as $45. Squee!!! I’m so happy for you… and hope Amazon gets their act together! I want to read ‘Impeccable’ reimagined!! I just finished your novel two days ago (it made for great de stressing during a bad storm, by the way!) but I just wanted to let you know this is the novel I’ve been waiting for since I was just a kid. I love it so much. I’m already keeping an eye out for the next one to go on preorder. I just wanted to thank you for writing this, and wish you well on your adventures writing the next one. Thank you again, so much! I received my copy last week and stayed up late last night just to finish (even though I had work early in the morning). I’m honestly in love with every single character (except Nona and Senna lol!) and really enjoy the parallels from ‘Impeccable’. So, so excited for the next book and I really hope we get to revisit Tsumiko and Argent in future installations, especially since Akira and Suuzu will feature in the next book and Argent’s status by the end of Book 1 (no spoilers haha). I’m so happy you’ve gotten the opportunity to write a whole series and blessed that you have shared it with us, your adoring fans. If you ever publish a hard cover copies (maybe once all the books are finished?) and/or an anthology with BTS stuff, family trees, etc. I would buy them all in a heartbeat! When is the second book being released ?? At the moment, the release date for Bk2 isn’t set. But I hope to bring out Kimiko and the Accidental Proposal this autumn. So glad to add your book to my collection, it has been a treat, I have been reading the last two nights and hope to finish tonight. I love how your work pulls from themes that we have loved in your fanfiction. Keep up the great work. I hope to own all 7 books at some point!! I can’t tell you how happy I was to read this at long last. It was over much too quickly… though that’s probably because I binged on it over my night shift. XD. Also just saw a confirmation that the next one is based on Troved, and I COULDN’T BE MORE THRILLED HOLY CRIPES. Will have all eyes out for the next release date! Hello. This is outside your control but still I thought an FYI might be of interest. I have a Nook Color reader. Yesterday I bought and downloaded your book (TSUMIKO…). Around p.163 and after it started locking up. Then I eventually would get a message box “Activity Reader is not responding. [select] Wait [or] Force Quit”. Something like that. Then, the whole thing would shut down. I contacted Nook Contact Support. They had the same problem. They said they would notify the publisher (and that I should try again in a couple of weeks). So, as said, I know the issue is out of your control but if you have a contact who might move it along faster or would want to track the issue, this is just an FYI. Also, I enjoyed the book up to p.163 and am looking forward someday to reading the rest. This is out of my control, but I can check with the publisher/printer to see if they’re working on a fix. Thank you for your patience! Same for me I bought the book because Ilona recommended it and I love the book! The world you have described is very fascinating and intriguing and I couldn’t put the book down. I am excited and waiting for the second book! Will you be releasing this book in hardbound format? There is a paperback edition. Btw, love, love your book! I read it in KOBO and I want to hopefully buy it in hardbound format, hence, my question prior. Oh, yes. Kimiko and the Accidental Proposal will begin showing up in all the usual online venues soon, Kobo included. Well, I found this book accidentally after Amazon suggested I might like it. All I have to say to that is MOOOOAAAAARRRRR PLEASE. Please. Pudding please. I… I want to know about the horse clans and the phoenixes and the dragons, and non-winter foxes and the monkeys, and THE CATS TOO, ok? Please. Please don’t stop at 7 books. P.S. The Hajime Kindaichi series is pretty good, if you’re interested in murder mysteries. Curious about all those clans? Then I suggest you watch for upcoming stories in the Songs of the Amaranthine collection. They give me an excuse to explore many more facets of the world of the Amaranthine. 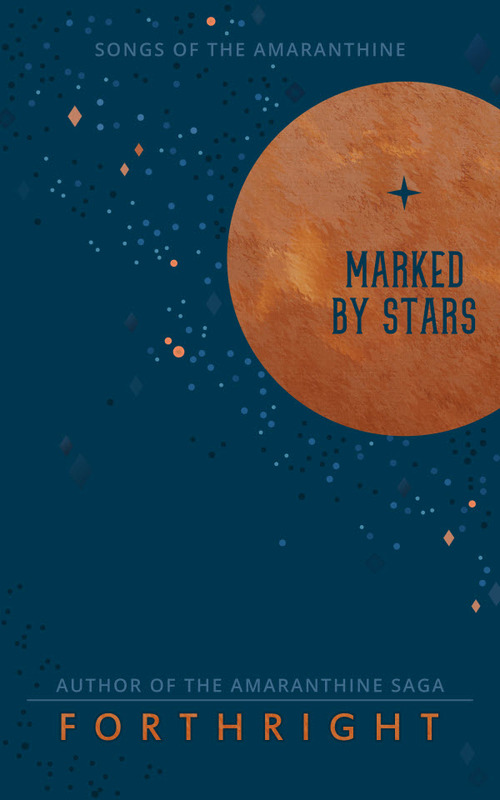 Marked by Stars is due to release (digitally) in early December. You can follow this blog via email subscription. Another useful way to make sure you don’t miss new releases is to follow an author on Goodreads/Amazon. They’ll alert you to pre-orders, book sales, release days, etc. Very handy. I just finished Marked by Stars! That was so beautiful! Very heart wrenching at times! I was so pleased with the ending. Finally wanted. Finding out about the Amaranthine backstory is going to be fun! Are you planning on keeping these as separate entities or will you be combining them into a book? Either way, I’m looking forward to your next offering. I know it will be wonderful. This may be completely outside your control and/or knowledge, but it would seem Marked by Stars is not (yet) available on Kobo. Do you know if this is by design, by accident and just a matter of time, or one of those great mysteries of the digital world because it really should be there already? I’m not even sure why Tsumiko came up in my Amazon recommendations, but I bought it. Then I read it, and had to buy Kimiko, then Marked by Stars. I have been reading and re-reading them all week! I know nothing about fan-fic, but you certainly have a new and ardent fan in the ebook sphere! I’m not familiar with your fanfiction, but I am delighted to have found you. Ilona Andrews recommended Tsumiko and the Enslaved Fox on her blog, and after reading the opening snippet on Amazon I knew I had to have the whole series. The worldbuilding is fantastic, and Ever Starmark is my favorite character so far. He is just so adorable! Just finished reading Marked by Stars and I’m soooo emotional for some reason. After reading Kimiko and the Accidental Proposal— the ending in Marked by Stars was beautiful! I can’t wait to read more from the Amaranthine verse. Hi Forthy! Just wondering if the ‘Songs’ series will be available in print or just digital? Amazon lists the first 2 books for the Kindle and I was really hoping to get a physical copy. April 2019 (for Kindle e-books). Other venues will vary depending on how they’re processed. Now that there are audiobooks, will book 3 release an audiobook at the same time as the print? I love print, but find it hard to find enough time to sit and read these days….audiobooks serve my purposes and fuel my imagination while still allowing me to “adult”. I’ll always post news here when I have it. Rereading Kimiko for the fourth or fifth time. Will we see them in further stories? Maybe you’ll start a separate series of books for post-Saga canon? I will buy all the things. I will. Just watch me.